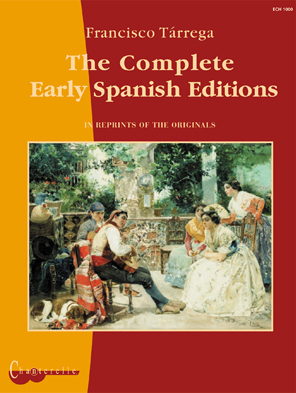 This collected edition contains all of Francisco Tarrega's compositions which were published in early Spanish editions. They are presented as unaltered reprints dating from 1902-1920. Sueno del Inocente Adagio de Bizet en "La Arlesienne"
A Phenomenal collection of original Tarrega works and transcriptions. Excellent background notes at the beginning of the book. Very comprehensive; over 300 quality pages.